The images of last year's desert trek will appear as the spirit moves. It moved today and I did this on a sheet of Blue Lake. Camels abound in the outback, left overs from the early explorers. In 1931 Lasseter's camels allegedly "bolted" leaving him stranded 100 miles from Kata Tjuta (Mt Olga). He never made it however the camels did well. Now it's calculated that 3,000,000 inhabit central Australia. WOW! I am so pleased that I dropped by this a.m. This is fabulous Dave! I love it!! That's very true Sandy. It does seem to take a while to sink in, thanks. 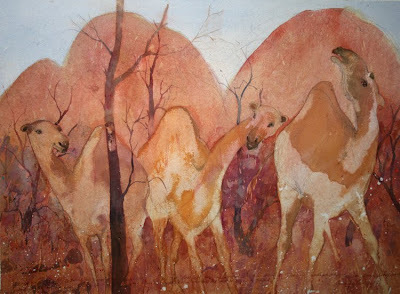 Wow David, I didn't notice the camels at first, so I love the way you have 'settled them into' the landscape. Like so many creatures of Central Australia, camouflage is critical to survival. Even though they are 'introduced', they come from arid conditions not all that dissimilar to our own. Somehow you've succeeded in translating (for me anyhow) 'warmth/heat' into 'coolness/calm'. The warm colours, and even the camels (who seem content!) convey the feeling of a cool oasis of dawning consciousness, an epiphany of ancient life cycles,,, the rhythm of the horizon echoing that feeling. Thanks Wayne, camels have settled in most certainly. Things change and adapt, especially out there on the edge where life and death play happily like a couple of innocent kids under the desert oaks. It makes the whole politic of climate change a bit of a laugh. Camels make me smile, are they supposed to be funny, you think? Great job painting them and giving them an original look! I've never been to Australia but I sure wouldn't have thought to run into camels there. Yeah I think camels are deliberately funny, so are their little cousins the llama. If you came here before about 1850 you'd never have seen a camel. Great one! Yep whimsical, but that is what I like about it and the harmony you have achieved with the shapes and colours. Have never been outback, but will one of these days! G'day Charles, I know it's a cliche, but yes you must go to the outback. It's not that far really but could be another planet. I reckon a flight up to Alice and hire a 4wd would be the most efficient way to do it. Go in Spring. Thanks for checking my blog out. Will put on a link t yours.